I finally got around to using my CG Peachy Keen polish.. It has been sitting in my untried drawer for a few moments in time.. I started off by painting my nails with it and just figured I would decide what to do after painting it on.. And omigosh! What a colour!! I didn't think it would be so.. bright? I figured it would be a touch more brilliant than CG II, but it is totally different! I actually kind of love this polish..
Once it was dry-ish (I am not a patient person when it comes to drying time on polish), I decided try and gradient pinks.. I used this Essence gem that I got in the Elfster Secret Santa exchange.. And I notice it when I look at my nails, but it was very faint, so instead of work on the gradient effect, I just grabbed a sponge and sponged on OPI Elephantastic Pink. I actually really enjoy this subtle yet in-yo-face look! It is perfect for summer.. Now if we could only begin summer here..
Now a question.. I do believe I have reached a plateau with my cuticle cream. It just doesn't seem to be doing as well as it once did.. Here in lies the question.. What cuticle creams do you use/like/have heard good things about.. I have read quite a bit on the Lush cuticle cream.. And according to friends we actually have one here situated in a mall.. I could venture out and get it.. But of course I want to check with the polish crowd first. Lemme know! I hope everyone is having a terrific Thursday and will continue to have a wonderful week!! Tierney - Thankies doll! And I am seriously not worried about when it gets sent out.. I just know that one of these days I will have it in my possession and all will be well! I picked up a 'thing' or two for you, so hopefully I will get those gems shipped out asap as well!! ThRiSzHa - Thank you (: you flatterer you (: Actually, this works out well because I always love the creations you post!! shortnails - Actually, I stuck fake nails on to my nails.. Only because I knew I would be using large amounts of glitter and I did not want to cry during removal - heh! BUT! Awhile back, on a blog somewhere out there.. They posted about the 'foil method' for removing glitter polishes. You put your polish remover on cotton balls, apply said cotton balls to the nail, then wrap the fingertip in tin foil and let sit for a couple of minutes. Afterwards, you just take off the tinfoil and the polish should basically all be removed. I did use this method and it seriously works! I think there were two nails that I had to 'scrub' for a swipe or two. So much better then taking an hour to remove manually!! I haven't tried the Lush Lemony Flutter but I use Orly Cuticle Therapy Creme and I find it to be quite awesome myself. 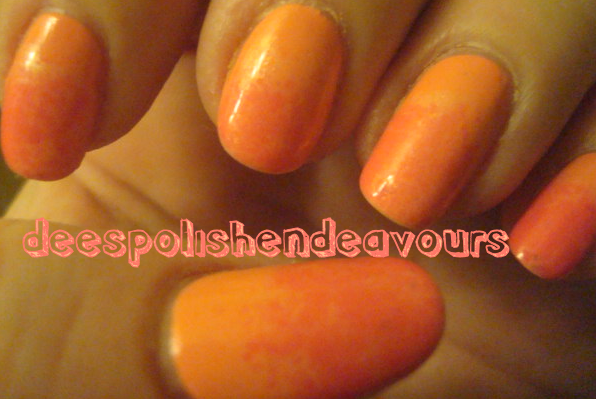 Love that Peachy Keen, such a pretty color, nice sponging! what sponge did you use? it looks really gradient like. When I sponge stuff on its like blob...not even close to gradient looking. maybe my sponge does not have enough holes. Okay..I won't lie ..i'm cheap. I heard about the cotton ball/ aluminum foil technique but I have never used it because I'm afraid that it uses way too much polish remover and 10 cotton balls, one of each finger. Maybe I need to cut the cotton balls in half. The cotton balls have to be really drenched right? nice mani !! i love peachy keen !! I love it! It's different and, weird and bright!